Phoenicia, Tyre. Quarter Shekel, 3.20gg. (1h). 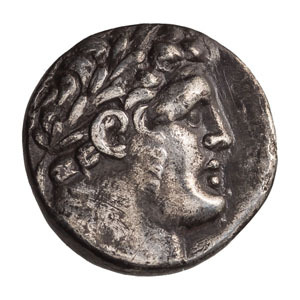 Phoenicia, Tyre, Year 6 = 121/120 BC. Obv: Laureate bust of Heracles (Melqart) right. 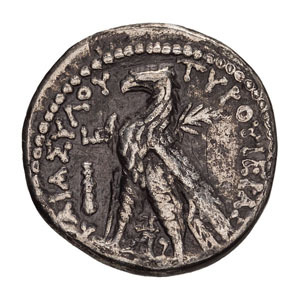 Rx: TYPOY IEPAΣ - KAI AΣYΛOY Eagle with closed wings standing left on prow, with palm branch behind shoulder and Phoenician letter between his legs; date LC (apparently) and club in left field. Dated Coins of Antiquity p. 514, Coin 323. The extremely rare smallest deomination in this famous Tyrian series which usually included only shekels and half shekels. Toned EF/VF. NGC 4625019-008. 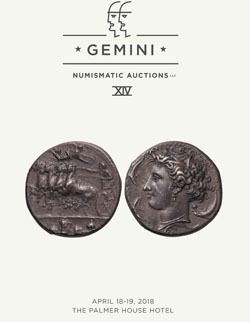 Purchased from Amphora Coins in 2011. A very rare fractional denomination at Tyre, listed by Dated Coins of Antiquity with only three dates, namely Year 2 (two citations), Year 6 (one citation: "in trade", perhaps our coin), and Year 9 (three citations).